Christie was the sponsor of the James B. Hunt Jr. Library’s Code+Art contest at North Carolina State University. The contest challenged students to develop large-scale, data-driven “generative art” for library’s 20-foot wide Art Wall and curved iPearl Immersion Theater. The results were on display until April 29. 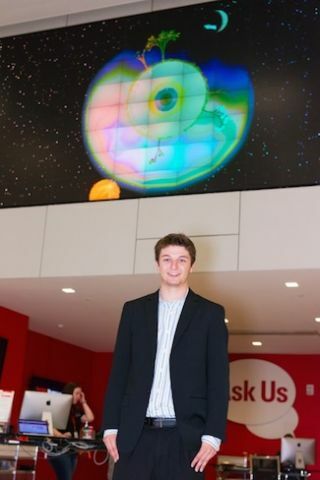 CodeArt Contest's First Place Finisher Anthony Smith in front of winning entry at North Carolina State University. Photo courtesy of James B. Hunt Jr. Library.Anthony Smith, a senior majoring in computer science with a concentration in game development, captured first prize for his Fractal Forest visualization, which shows a planet that grows various types of trees in conjunction with people entering the library. It also features a sun and moon simulation and time and weather data. As people add to and interact with the visualization, it progresses and changes. The team from WKNC 88.1 FM, NC State's student-run radio station, earned second place with its music visualizer of the WKNC internet radio stream. This team consisted of Cameren Dolecheck, Harrison Wideman, Neal Grantham, Dylan Stein, and Colin Keesee.